This is the fifth article in the series of articles on NLP for Python. In my previous article, I explained how Python's spaCy library can be used to perform parts of speech tagging and named entity recognition. In this article, I will demonstrate how to do sentiment analysis using Twitter data using the Scikit-Learn library. Sentiment analysis refers to analyzing an opinion or feelings about something using data like text or images, regarding almost anything. Sentiment analysis helps companies in their decision-making process. For instance, if public sentiment towards a product is not so good, a company may try to modify the product or stop the production altogether in order to avoid any losses. There are many sources of public sentiment e.g. public interviews, opinion polls, surveys, etc. However, with more and more people joining social media platforms, websites like Facebook and Twitter can be parsed for public sentiment. In this article, we will see how we can perform sentiment analysis of text data. 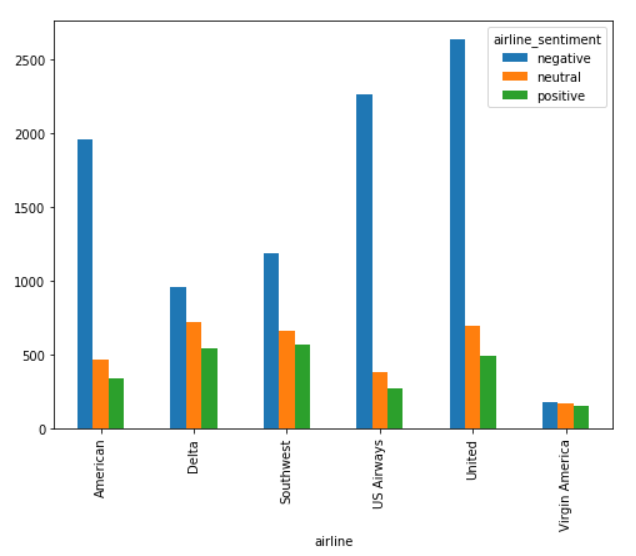 Given tweets about six US airlines, the task is to predict whether a tweet contains positive, negative, or neutral sentiment about the airline. This is a typical supervised learning task where given a text string, we have to categorize the text string into predefined categories. To solve this problem, we will follow the typical machine learning pipeline. We will first import the required libraries and the dataset. We will then do exploratory data analysis to see if we can find any trends in the dataset. Next, we will perform text preprocessing to convert textual data to numeric data that can be used by a machine learning algorithm. Finally, we will use machine learning algorithms to train and test our sentiment analysis models. Note: All the scripts in the article have been run using the Jupyter Notebook. The dataset that we are going to use for this article is freely available at this Github link. In the output, you can see the percentage of public tweets for each airline. United Airline has the highest number of tweets i.e. 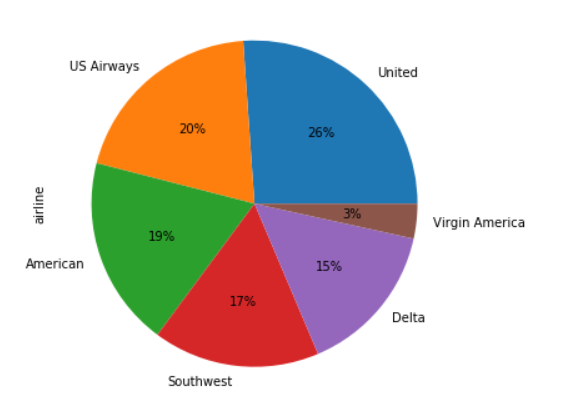 26%, followed by US Airways (20%). 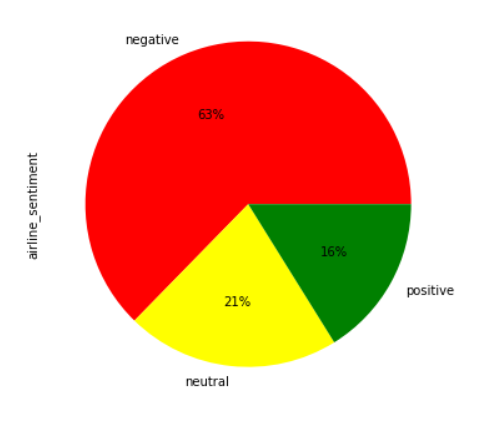 From the output, you can see that the majority of the tweets are negative (63%), followed by neutral tweets (21%), and then the positive tweets (16%). 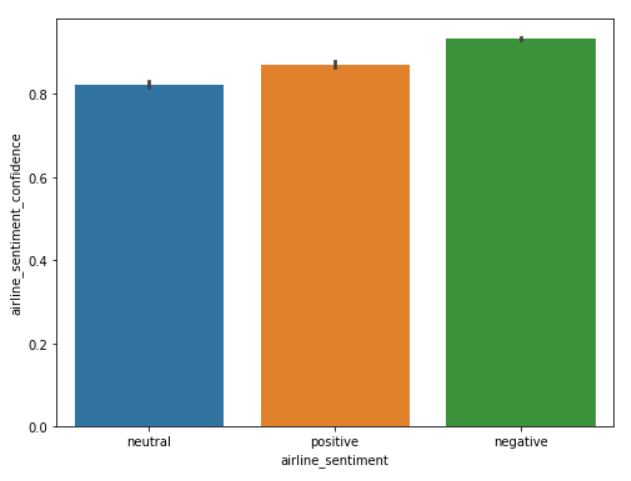 It is evident from the output that for almost all the airlines, the majority of the tweets are negative, followed by neutral and positive tweets. Virgin America is probably the only airline where the ratio of the three sentiments is somewhat similar. From the output, you can see that the confidence level for negative tweets is higher compared to positive and neutral tweets. Enough of the exploratory data analysis, our next step is to perform some preprocessing on the data and then convert the numeric data into text data as shown below. Tweets contain many slang words and punctuation marks. We need to clean our tweets before they can be used for training the machine learning model. However, before cleaning the tweets, let's divide our dataset into feature and label sets. Our feature set will consist of tweets only. If we look at our dataset, the 11th column contains the tweet text. Note that the index of the column will be 10 since pandas columns follow zero-based indexing scheme where the first column is called 0th column. Our label set will consist of the sentiment of the tweet that we have to predict. The sentiment of the tweet is in the second column (index 1). To create a feature and a label set, we can use the iloc method off the pandas data frame. Once we divide the data into features and training set, we can preprocess data in order to clean it. To do so, we will use regular expressions. To study more about regular expressions, please take a look at this article on regular expressions. In the script above, we start by removing all the special characters from the tweets. The regular expression re.sub(r'\W', ' ', str(features[sentence])) does that. Next, we remove all the single characters left as a result of removing the special character using the re.sub(r'\s+[a-zA-Z]\s+', ' ', processed_feature) regular expression. For instance, if we remove special character ' from Jack's and replace it with space, we are left with Jack s. Here s has no meaning, so we remove it by replacing all single characters with a space. However, if we replace all single characters with space, multiple spaces are created. Therefore, we replace all the multiple spaces with single spaces using re.sub(r'\s+', ' ', processed_feature, flags=re.I) regex. Furthermore, if your text string is in bytes format a character b is appended with the string. The above script removes that using the regex re.sub(r'^b\s+', '', processed_feature). Finally, the text is converted into lowercase using the lower() function. Statistical algorithms use mathematics to train machine learning models. However, mathematics only work with numbers. To make statistical algorithms work with text, we first have to convert text to numbers. To do so, three main approaches exist i.e. Bag of Words, TF-IDF and Word2Vec. In this section, we will discuss the bag of words and TF-IDF scheme. Bag of words scheme is the simplest way of converting text to numbers. Doc1 = "I like to play football"
Doc2 = "It is a good game"
Doc3 = "I prefer football over rugby"
In the bag of words approach, each word has the same weight. The idea behind the TF-IDF approach is that the words that occur less in all the documents and more in individual document contribute more towards classification. In the code above, we define that the max_features should be 2500, which means that it only uses the 2500 most frequently occurring words to create a bag of words feature vector. Words that occur less frequently are not very useful for classification. Similarly, max_df specifies that only use those words that occur in a maximum of 80% of the documents. Words that occur in all documents are too common and are not very useful for classification. Similarly, min-df is set to 7 which shows that include words that occur in at least 7 documents. In the previous section, we converted the data into the numeric form. As the last step before we train our algorithms, we need to divide our data into training and testing sets. The training set will be used to train the algorithm while the test set will be used to evaluate the performance of the machine learning model. In the code above we use the train_test_split class from the sklearn.model_selection module to divide our data into training and testing set. The method takes the feature set as the first parameter, the label set as the second parameter, and a value for the test_size parameter. We specified a value of 0.2 for test_size which means that our data set will be split into two sets of 80% and 20% data. We will use the 80% dataset for training and 20% dataset for testing. Once data is split into training and test set, machine learning algorithms can be used to learn from the training data. You can use any machine learning algorithm. However, we will use the Random Forest algorithm, owing to its ability to act upon non-normalized data. Finally, to evaluate the performance of the machine learning models, we can use classification metrics such as a confusion metrix, F1 measure, accuracy, etc. From the output, you can see that our algorithm achieved an accuracy of 75.30. The sentiment analysis is one of the most commonly performed NLP tasks as it helps determine overall public opinion about a certain topic. In this article, we saw how different Python libraries contribute to performing sentiment analysis. We performed an analysis of public tweets regarding six US airlines and achieved an accuracy of around 75%. I would recommend you to try and use some other machine learning algorithm such as logistic regression, SVM, or KNN and see if you can get better results. In the next article I'll be showing how to perform topic modeling with Scikit-Learn, which is an unsupervised technique to analyze large volumes of text data by clustering the documents into groups.